The PMDX-410 has been replaced by the PMDX-414 which adds direct to panel mounting and screw terminals. Support for the PMDX-410 has NOT gone away. It continues to utilize the same Mach4 plug-in as our other SmartBOB USB products. 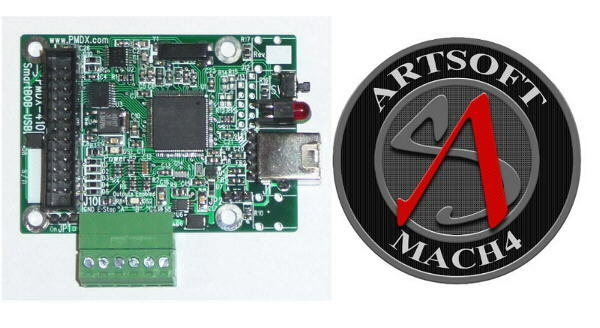 The PMDX-410 is a motion control pulse engine for connecting CNC machines to the Mach4 family of software using a USB port. The PMDX-410 is designed to be connected to your existing breakout board or driver box such as the PMDX-340 or a Geckodrive G540 using a 26 pin ribbon cable that emulates a parallel port. It will support the features of the breakout board or driver box including (if provided) optical isolation, a "charge pump" and spindle speed control. It also provides 3 additional inputs via a terminal strip. 5) The machine interface provides equivalent signals to one parallel port including 8 step and direction signals, 8 input signals including one dedicated to emergency stop, and 4 output signals. The first 5 inputs equivalent to those on a parallel port are available on the ribbon header. The extra 3 input signals are available only on the terminal strips. In the future these inputs will also function to provide a single encoder input supporting phase signals up to 1 MHz using a hardware quadrature decoder. The index signal will also be supported. This will make lathe CSS and threading possible. The functional capability of the PMDX-410 is very similar to the capability of a PMDX-122 breakout board plus 3 additional input signals but uses a 26 pin ribbon header for most interface signals. 6) The input signals have a pull-up resistor to allow use with simple mechanical switches or three-wire NPN proximity switches. These signals are filtered to reduce noise sensitivity. The inputs will also accept 5 volt logic signals. PNP proximity switches will require external adaptation using a PMDX-105 or similar. The first 5 inputs are protected against voltages up to 50 volts above ground. The 3 extra inputs are protected against voltages up to 7 volts above ground. 7) The PMDX-410 also supports the PMDX-126 breakout board running in Expanded Input mode to allow 10 inputs including emergency stop from the PMDX-126 and also the 3 extra inputs on the PMDX-410, giving a total of 13 inputs when used with a PMDX-126 in Expanded Input mode. 8) The step and direction outputs are 5 volt logic signals with up to 24 mA of drive current available. In addition to interfacing to a breakout board, they can also directly drive the step and direction inputs of motor drivers. 9) The 4 control outputs are 5 volt signals with up to 24 mA of drive current available. In addition to interfacing to a breakout board, these signals can also drive solid state relays or the PMDX-104 light duty 4 channel relay board. 12) An LED is provided for "Outputs Enabled" to indicate that the unit is ready to run the machine and as an aid in troubleshooting. 13) The board can be mounted against a panel with holes to allow access to the USB jack, pushbutton, and status LEDs. 16) The USB interface is protected against back feeding of power from a local source. 17) The USB interface has jumper selectable termination of the shield conductor of the USB cable. 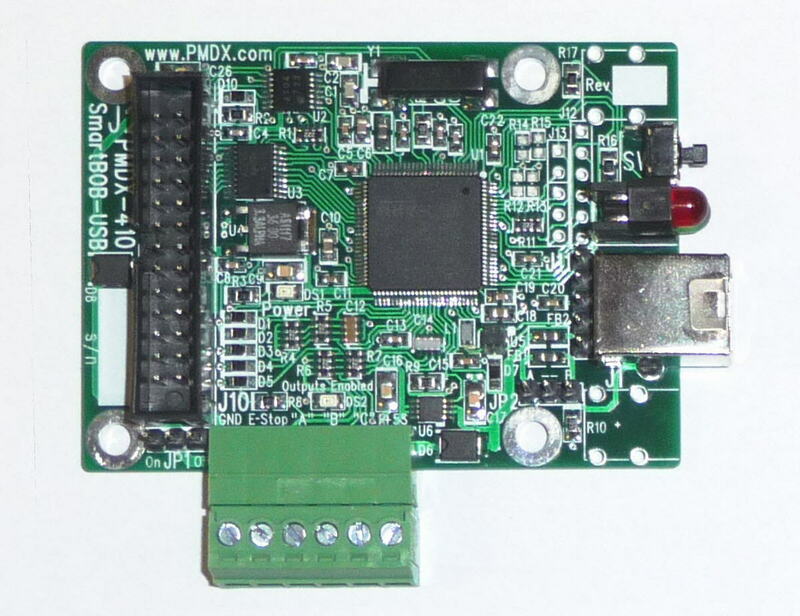 18) The PMDX-410 is a compact 2.75" by 2.0" board that fits in tight spaces. interface is available to work with the PMDX-410. Direction on pins 2, 4, 6, 8. E thernet or USB and for machines needing more I/O or specialized interfaces like MODBUS.